Graph module/library that works in Scriptable? 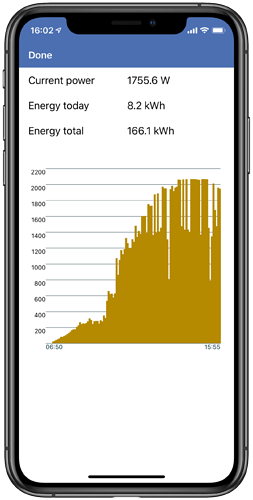 I made a small Scriptable script that captures some data from (the website for) my solar panels. The script currently shows the current power production, today’s energy production, and the total energy production. That’s nice, but it could be even better. One of the API calls (also) returns an array of key-value pairs where the key is a timestamp (5 minutes apart) and the value is the power production at that time. It would be nice to use that to produce a graph of the production during the day (the native App for my inverter already does that, but the UI/UX of that App is not very nice). An alternative to a graphing library is to draw the graph yourself using the DrawContext API. How can I horizontally center the graph in a row of a table? In order to render a transparent background, you’ll need to set context.opaque = false. You should be able to center the image row.centerAligned(). Here’s a small sample script and a screenshot of the result. I guess I got confused because the documentation says "Default is false". Ugh. That’s a mistake Sorry for the inconvenience.